Bolsonaro's U.S. visit comes as Maduro clings to power in Venezuela. 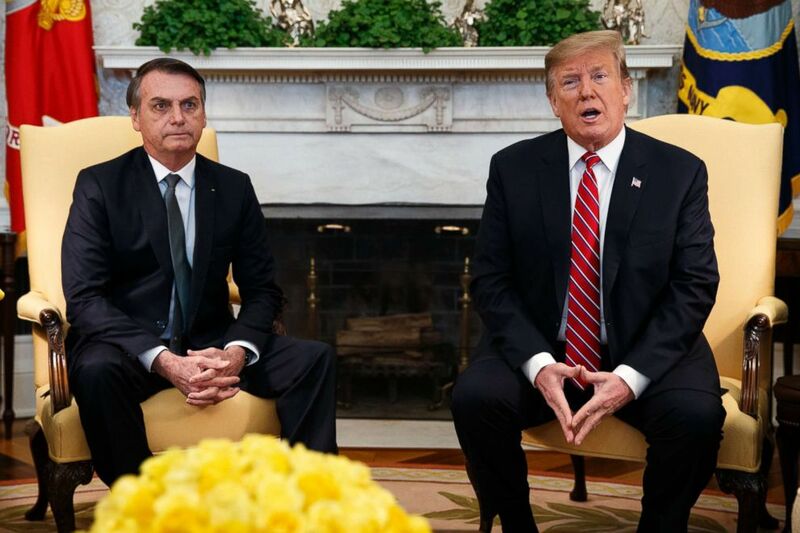 President Donald Trump and "the Trump of the Tropics," Brazilian president Jair Bolsonaro, met face to face at the White House on Tuesday. Bolsonaro -- a nationalist, Twitter-loving, "fake-news" decrying politician -- chose to make the first bilateral trip of his presidency to Washington, where he has found an important friend and ally in Trump. (Evan Vucci/AP) President Donald Trump speaks during a meeting with Brazilian President Jair Bolsonaro in the Oval Office of the White House, March 19, 2019. As part of a three-day visit in Washington, Bolsonaro held a press conference with Trump as he aims to strengthen economic ties and positioning with the U.S. as Brazil seeks an allied front in the Western Hemisphere. In a statement ahead of the visit, White House press secretary Sarah Sanders said the two leaders will discuss "opportunities for defense cooperation, pro-growth trade policies, combating transnational crime and restoring democracy in Venezuela." A senior administration official, who requested anonymity, told reporters Bolsonaro's visit represented a "real opportunity to fundamentally remake our relationship with Brazil." "The U.S.-Brazil relationship has always been one of potential, but yet that potential has not always been met," the senior administration official said. "This time it is different. This is a historic remaking of the U.S.-Brazil relationship where there is truly going to be a North-South axis of the two largest economies in the Western Hemisphere and a true partnership of the largest economies." 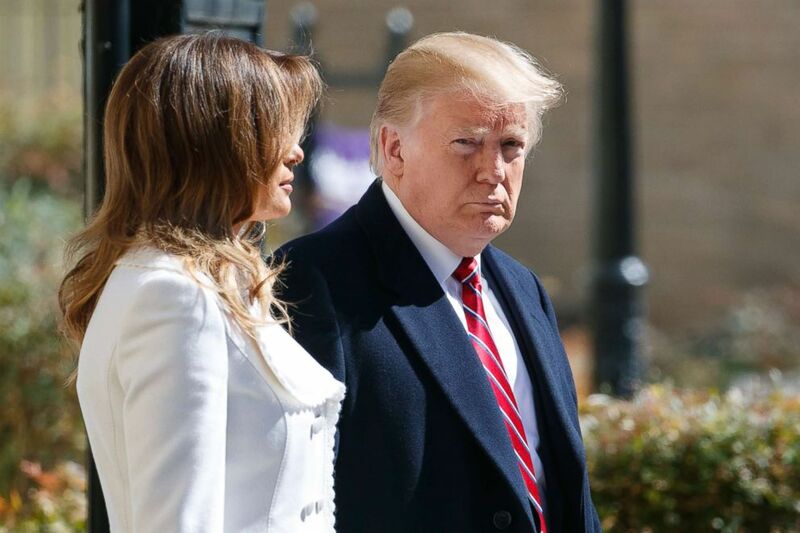 At the start of their White House meetings, the president said he is considering NATO membership or some kind of similar alliance for Brazil. (Jim Watson/AFP/Getty Images) President Donald Trump takes part in a joint press conference with Brazil's President Jair Bolsonaro in the Rose Garden at the White House on March 19, 2019, in Washington, D.C. In the Rose Garden press conference, the two leaders said they were able to discuss their goals in Venezuela. Trump threatened tougher sanctions on Venezuela and said "all options are on the table." Maduro would not divulge any new strategies in the region, but said establishing a true democracy in the country was a shared priority. The leaders on Tuesday also discussed a Brazilian offer to grant the United States access to a rocket launch site, the removal of a Visa requirement for Americans traveling to Brazil, and trade. 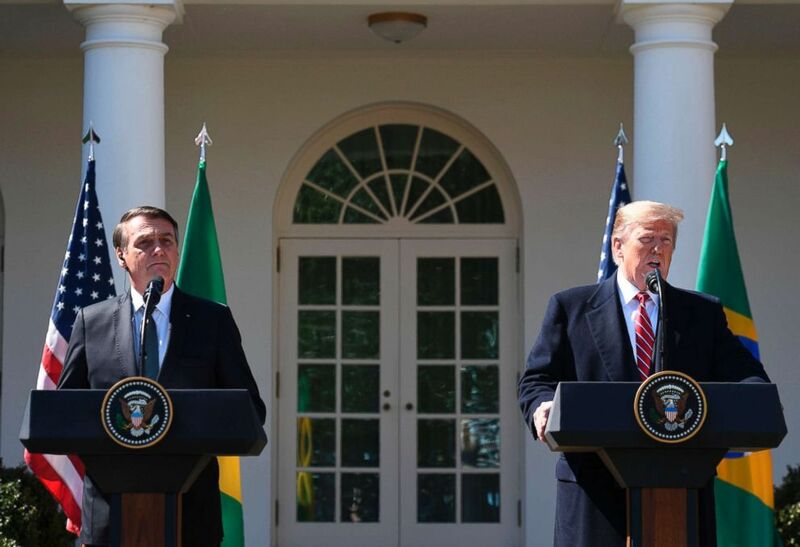 If Bolsonaro's goal was to strengthen the relationship between Brazil and the United States, it appeared he was successful at least in gaining the friendship of Trump, who gave him a warm welcome in the Rose Garden. Bolsonaro even got a chuckle out of the president for saying he believed he would get re-elected. "Well, it's an internal affair. We will respect whatever the ballots tell us on 2020, but I do believe Donald Trump is going to be re-elected fully," Bolsonaro said when asked about the 2020 elections. "Thank you. I agree," Trump said with a smile. Trump said he liked to hear Bolsonaro use the term "fake news." In his opening statement, Bolsonaro said that Brazil and the United States "stand side by side in their efforts to ensure liberties in respect to traditional family lifestyles, respect to god, our creator, politically correct attitudes, and against fake news." Trump said he was "proud" to hear his new Brazilian buddy use the same term. (Sergio Lima/AFP/Getty Images) Brazil's President Jair Bolsonaro welcomes Paraguay's President Mario Abdo Benitez at Planalto palace in Brasilia, March 12, 2019. Bolsonaro, who was accompanied on his trip to the United States by his son, lawmaker Eduardo Bolsonaro, visited CIA headquarters in Langley, Virginia, on Monday and addressed the U.S. Chamber of Commerce. Brazil is the second-largest economy in the Western Hemisphere, and the United States is Brazil's second-largest trading partner after China. "For the first time in a while, a pro-America Brazilian president arrives in D.C.," Bolsonaro tweeted upon arriving in Washington. "It's the beginning of a partnership focused on liberty and prosperity, something that all of us Brazilians have long wished for." Like Trump, Bolsonaro is a right-wing populist with a penchant for rocking the status quo and using Twitter to blast his message around the globe. Bolsonaro has been accused of making racist and homophobic remarks and recently has come under fire for a sexually explicit tweet during Brazil’s Carnival festival. Trump was one of the first world leaders to call and congratulate Bolsonaro after this landslide victory in October. Similar to Trump's election, Bolsonaro's win stunned the world and was part a wave of nationalist, right-wing leaders elected in Latin America. "His election, he broke all of the historic taboos of winning an election in Latin America. He was unabashedly, particularly in Brazil, pro America," a senior administration official said of Bolsonaro. "He ran on a campaign that he wanted to be the best friend of the United States that he wanted to have this close relationship with President Trump, and what that would mean for Brazil, for the region, for the world, I think that was very important." 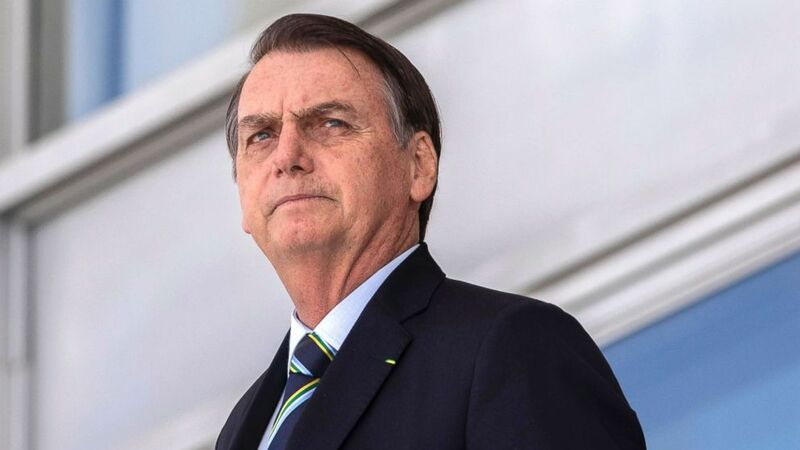 The official said the president took note of Bolsonaro's Trump-like rhetoric and social media presence, and called Bolsonaro to congratulate him within hours of his election. U.S. officials hope the visit will not only boost their economic relationship but align efforts to provide humanitarian assistance to Venezuela. Brazil shares a border with Venezuela and, like the United States, has joined with dozens of other world leaders in pressuring socialist Nicholas Maduro to turn over power to opposition leader Juan Guaido. But while Trump has said "every option is on the table" in Venezuela, suggesting the use of military force, Brazil has pushed for diplomatic talks to lead to a change in power. A senior administration official said Brazil plays an important role as an "interlocutor" between the U.S. and Venezuela. "Brazil has allowed the United States to preposition humanitarian aid for Venezuela on Brazil's northern border and we are very grateful to that and we thank him for working tirelessly to provide aide to the Brazilian people and them opening their doors," the official said. "There's also an opportunity here where they can be very good interlocutors. The Brazilian Military has very good relationships with the Venezuelan military and clearly communicate with them as to what should be the role with the Venezuelan military in regards to civility and not repressing and not maintaining the usurpation of democracy Maduro seeks." The U.S. and Brazil hope to end the meetings with signed agreements, including an agreement that would allow the U.S. to launch satellites and rockets into space from Brazil. "You will see -- after the visit tomorrow, we will plan to announce a joint statement that will have a lot of deliverables, some which are currently, frankly, right now being signed and being finalized and being negotiated. And that's all extraordinarily positive," an official said Monday. "We think that we have, really, a historic opportunity to re-frame hemispheric relations with this North-South axis."